Everyone of all ages most welcome! 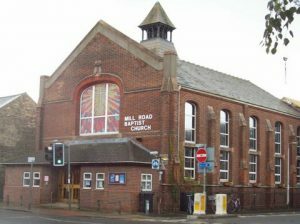 Mill Road Baptist Church is a lively, multicultural, Baptist church situated on Mill Road in the Romsey Town area of Cambridge UK. Above all else we want to know and experience more of who God is and what he has done primarily through the life, death and resurrection of his Son, Jesus Christ. We seek to follow Jesus by loving God with all that we are and loving our neighbour as ourselves so that God’s kingdom may come, and His will be done, on earth as it is in heaven. If you would like to know more please feel free to look around the website or, better still, come and see us at any of our services or meetings!